A new model built in part by a University of Alberta geophysicist contradicts a long-held idea about how the southern and central central Rocky Mountains were formed. 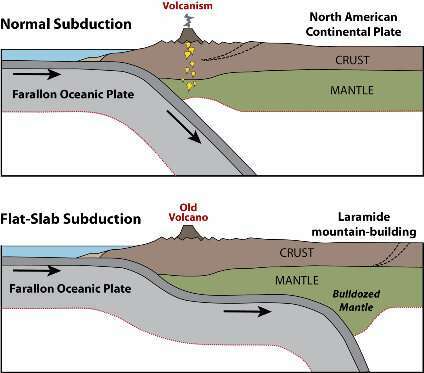 Claire Currie was part of a team that developed a model of the flat-slab subduction process to illustrate the unique Laramide orogeny, a series of mountain-building events that occurred between 50 million and 80 million years ago. The team found that tectonic plates shoved their way inland from the coast, and that mountain building was caused by the increase in stresses at the edge of the continent. Previously, scientists had thought the flattening was marked by an eastward migration of volcanic activity, and that this caused deformation to occur in the continental interior by stresses on the bottom of the continent. "Our models show that the flattening caused the lowermost part of the continent to be 'bulldozed' and pushed inland," said Currie. "This resulted in the termination of volcanism above the subduction zone and triggered the mountain-building event by increasing the stresses at the continental edge." The model used robust information from various sources, including records of volcanic activity in the region, seismic images of Earth's interior and geological data about the timing and location of deformation. Currie and her colleagues then developed computer models to understand the dynamic processes behind the Laramide event, with the aim of improving understanding of similar processes elsewhere in the present-day world. "We believe similar processes occur elsewhere today, such as below Peru, Chile, Mexico and perhaps eastern Alaska," said Currie. "As a result, our work provides insight into the origin of deformation, earthquakes and volcanism in modern areas. We hope this will encourage new studies to test and refine the models." Currie explained these types of models can be valuable to governments and communities for creating emergency preparedness policies and procedures, and for understanding the geological setting for natural resources, such as hydrocarbon and mineral deposits. 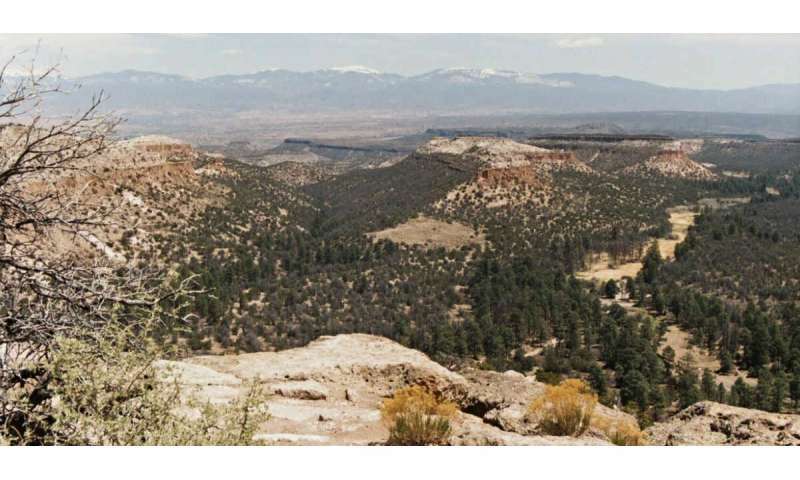 The research was conducted with Gary Axen and Jolante van Wijk from the New Mexico Institute of Mining and Technology. The study, "Basal Continental Mantle Lithosphere Displaced by Flat-Slab Subduction," was published in Nature Geoscience. Is 'shoving their way inland' the same as 'the major continent pushing its way outward?' Particularly since Peru, Chile, Mexico, etc., show the same effect? IsThis Earth expansion by another name?